BIDTELLECT Mobile, Native, Banner advertising network details. 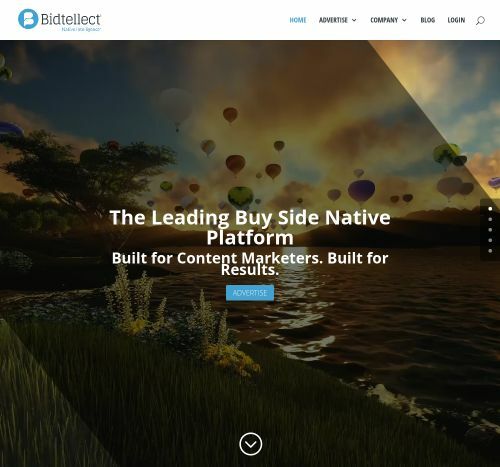 Bidtellect is a Native Advertising Platform that combines the smartest programmatic technology and optimized tools in order to deliver the best advertising product. As a Marketer, you have access to one of the most sophisticated web-based software. As the content is one of the most important parts of a marketing plan, it has to be manipulated in order to influence online strategies. Bidtellect is a wide technology platform that is working with the world’s biggest brands and they consider that their clients are also their partners. The platform is designed so it supports the 3 most common Native ad types. For additional information before registering on the Bidtellect platform, see the Information section to find out what Pricing Models they offer, which are their Targeting Options and Advertising Formats. Don’t forget to return on Affbank in order to leave a review about Bidtellect.